For now, Tig Notaro’s audience primarily consists of comedy connoisseurs who delight in her deadpan one-liners, but that could change in coming months. 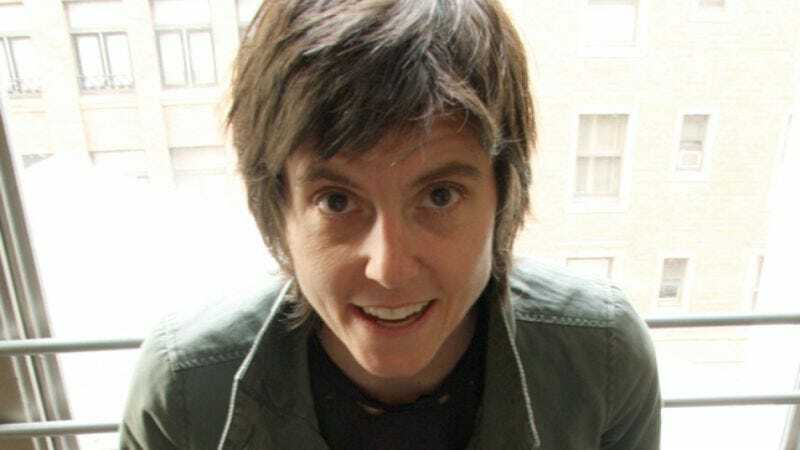 After 13 years of performing stand-up, including a stint on Last Comic Standing and guest spots on shows like The Sarah Silverman Program, Community, and In The Motherhood, Notaro may be poised to move from sideshow to main stage with her first comedy album, Good One, hitting shelves this August—a free track is currently available at tignotaro.com—and a pilot for Logo TV in the works. Notaro spoke with The A.V. Club about waiting for her career spotlight, honing her craft, and making friends with the competition. The A.V. Club: You’ve stated before, “I’ve always kind of hesitated to put out a CD or DVD. As time goes on, it’s hard to capture myself and be excited about it.” What prompted you to do this album? Tig Notaro: I was in Bloomington, Indiana, which is where Secretly Canadian is based out of, and the label had come to several shows of mine, a group of them. And they were just supportive and took me out for drinks after the shows and they were like, “Oh! Have you thought about putting out a record?” and I was like, “Yeah, uh, I’m not interested.” I felt like, realistically, I know I’m not a big comedy star. I know that certain people who are aware of comedy know who I am, but I felt like I was at a level in my career where it could be buried. I wanted to be excited about releasing an album. I wanted to feel like someone was excited rather than you know, like, “Oh Tig, how about we put out a record with you?” which I got offers to do with almost every label possible. [With those labels], I felt like I was just one of several [comedians] that they were going after at the time. It wasn’t like, “We gotta get Tig.” [When Secretly Canadian said], “Well, what if we put it out?” I immediately got excited. They were like, “We will have a publicist on this for three months. We will push this so hard. You’re going to be our first and only comedian signing right now.” It made me really excited to release a CD. AVC: You were coming from the music industry when you first started doing comedy. What prompted you to jump onstage the first time? TN: Well I’d always wanted to do it. I grew up with a couple of friends and we all kind of moved around the country together. They were going to college and I was just following them while they got an education. They wanted to move to L.A. to produce TV and I just thought, “Well, I’ll just go with them because that’s what we do.” It never dawned on me to even move to L.A. to work in the music business. L.A. just never crossed my mind. I thought I’d be in Denver. And then when I got to L.A., I opened L.A. Weekly and saw that you could do stand-up in Laundromats and coffee shops and rooftops and I was like, “Oh my gosh, I have to try this out.” So those friends of mine went with me and checked out all the comedy shows for a couple of weeks and then I finally was just like, “Oh, I could do this.” I became obsessed and my first time went really well. I got so cocky that I competed in a comedy competition my second time onstage and I tanked and left the stage after one minute. AVC: Why did you come back after that? TN: Because I had the first time. It’s almost like being stuck in an unhealthy relationship. It leaves you going, “Wait a minute, am I crazy? Things were good last time. Wait, it’s horrible now. Wait a minute, but it could be good again right?” It’s that confusion and if you stick with this unhealthy relationship, it eventually becomes what you originally saw, hopefully. It eventually, more than not, becomes a positive and good experience. AVC: Has your style changed from then until now? TN: Oh yeah it definitely has. I definitely still like writing one-liners, but I also think that I’ve changed a lot in that I’ve allowed myself freedom to grow. I remember I was on the road with the comedian Jimmy Dore and he told me that offstage I’m friendly and open and he said, “You know, when you’re onstage, you don’t smile. You have good jokes, but you’re not showing this side that people would be surprised about.” I was thinking in my head, “What do you know? You do your thing. I’ll do mine.” And then I remembered Sarah [Silverman] saying that sometimes when people are too much a character, they can’t go anywhere else. I started moving if I felt like it and smiling if I felt like it and writing longer jokes than one-liners. There’s a subtlety to it that sometimes people couldn’t put their finger on how I’ve changed, but it equals more confidence for them. They’re like, “You just seem more confident” and I think it’s because I became confident from allowing myself to just naturally go with where I really wanted to go rather than saying, “Wait, I can’t. I already made the decision to not smile and don’t move and just write one-liners.” It was so freeing to allow myself to just write long jokes that explore every angle that I could think of and just do whatever I felt like doing. That’s definitely how I’ve changed the most. AVC: You’ve collaborated with Sarah Silverman on several projects, and now she’s an executive producer position on your Logo pilot. How did that relationship start? TN: We met at a party years ago and we, after talking, found out we had just everything in common from favorite color to Chrissie Hynde being our favorite female vocalist. Then we didn’t see each other for a couple of years and we were on the same show in New York and she came up to me afterwards and complimented my comedy. We were both in L.A. a week later and she was like, “Hey, do you remember me? I’m Sarah Silverman” and I was like, “I remember you, Sarah Silverman.” She got my phone number and asked if I wanted to go to lunch and hike and hang out and we’ve pretty much been inseparable. We’ve worked together, but we’ve never had a business-driven relationship. It’s been like, “Let’s do a show together” or, “Do you want to come on the road?” It wasn’t this driven business of, “What can we do? How can we work together?” Friendship and working together has all come naturally. There’s no pressure. AVC: In watching The Tig Series [a collection of comedy interviews Notaro created for brightestyoungthings.com], there are clips of you talking to Mary Lynn Rajskub about the difficulties of being a sorcerer and speaking with Zach Galifianakis about a made-up musical called Fiddler On The Roofies. From those videos, it seems like comedy is just one giant sleepover and everyone’s having an amazing time, but comedians frequently complain that the industry is cutthroat. How have you found that landscape? TN: I have not found it to be cutthroat. The first time I really felt like I had a bad experience, and I don’t want to go into too much detail, but on another TV project that I had in development, I was like, “Oh, this must be what everybody talks about.” Because I really had not experienced that before. I’ve toured around the world. I’ve worked with men, women. I feel like I’ve been unusually lucky to have supportive friends around me and I feel tremendously supportive about my peers. I can’t wait to brag about how funny my friends are. I feel like there’s a certain mindset of person that looks for it and feeds off of it. I’m not doubting that it’s out there. I know that it’s a cutthroat business. I just feel like I don’t go toward that. If someone doesn’t want me working their club, they’re not going to hear from me again. I’m not going to fight or complain about it. I’d rather go someplace else. AVC: Do you put any credence in the idea that comedy is a boy’s club or that it’s weighted against women or the LGBT population? TN: I do not doubt that it is a man’s world. What influenced me so much with Chrissie Hynde is that she was like, “Just shut up and do it.” People can be coming up in this career faster than I am, man, woman, whatever, and to me, I’m not going to sit around and gripe about it. I want to get better. I want to work harder. I want to be really great at what I do. I don’t personally feel like I’ve dealt with any sort of discrimination or sexism. I’m not doubting that there might have been that going on and I just didn’t read it that way. To me, I read it as, “Well, they’re not into what I do” and that’s not the door I’m going to continue to beat down because I’ve found other places that are [into what I do], so that’s the direction I’m gonna go. I’ve toured all around the world. I’ve worked with so many different kinds of people and comedians and it was really only that recent project that I was in development on that I just thought, “This is a really, really unsettling thing and I’m going to walk away from this right now.” It just didn’t feel right. Whether it was discrimination, sexism, I just don’t know, but it was nothing I wanted to be a part of. They thought I was crazy from walking away from it, but I felt like I had won the lottery.